CANCELLATION POLICY: Within 14 days 100% of total revenue will be forfeited. We reserve the right to cancel any reservation, subject to issuing a full refund. In the event of a guest cancellation outside of 14 days, a $20.00 restocking fee will apply to all canceled reservations. Individual rate policies may vary. Hours of Operations The office is open Monday – Sunday: 9:00 am till 6:00 pm. For after-hours assistance, please call 941-203-8058 To comply with a county-mandated noise ordinance, the Tiki areas and or outside areas close at 10:00 pm SHARP! Security Deposit/ Damage: In lieu of a security deposit, we require the reserving party to provide us with a valid credit card which will be authorized for $1000 upon Check In. Authorization will be released no more than 24 hours after departure when the unit is inspected. By booking this reservation, we reserve the right to charge the booking party’s credit card up to an additional $1,500.00 for any missing items, or for any damage, the reserving party or any occupant and/or guest of the reserving party may have caused to the Unit. At the time of check-out, if the Unit is not left in a reasonable and clean condition, or in the event of missing items, or if any unpaid balance is still due, then the reserving party agrees and acknowledges that their credit card listed on file for the reservation will be charged to clean, replace, and/or repair said items at the fair market price or make any unpaid payments pursuant to the terms of the reservation agreement. 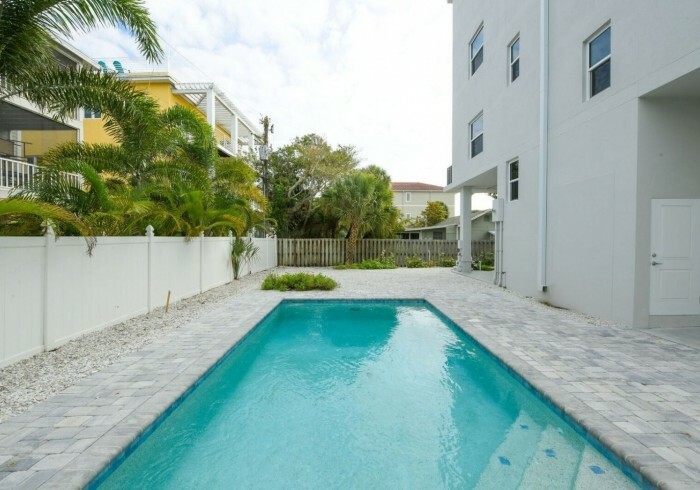 Family Tides newly renovated split level town homes in Siesta Key. Stunning remodel with all new furnishings, One King bed in first bedroom, One Queen bed in second bedroom, and two twins in the third bedroom. This rental is a quick walk to Siesta Key Beach Access, where you'll enjoy the white sandy beaches of Siesta Key. Fitness center discounts are available at Siesta Key Fitness. Across the street from the #1 Beach Siesta Key with a pool on property. SLEEPS SIX. Included with your stay: Complimentary Bicycles, Beach chairs, Beach-Towels, Free-rides around Siesta and a 7-day week office for your convenience and guest needs. New top of the line stainless appliances, cabinets and kitchen drawers, full-size washer and dryer in each unit. Fitness center discounts are available at Siesta Key Fitness.